We have already discussed about RecyclerView in the following tutorial Listing Items using RecyclerView and shown a recyclerview example in android studio. Today we will discuss about Android CardView in Android SDK which was introduced with the android material design through the support v7 library. We will show you how Android CardView can be implemented in a RecyclerView list. After reading this article you should feel comfortable creating Lists and Cards view in your android app. Android CardView provides a more advanced and flexible way of implementing complex and custom listview with more functionality that is required nowadays for our apps. We would be creating an Android CardView Example List app, where we will list 7 wonders of Modern World along with a Like Button and a Share Button. On clicking the Like Button it will get highlighted and show a message. Clicking the Share Button will provide you options to share the photo of the Item you clicked. After completion, the app would look like as shown in the video. Before proceeding we advice you to go through the Recycler View tutorial at the following link => Listing Items using RecyclerView. Since we won’t be repeating the concepts described in earlier above post. 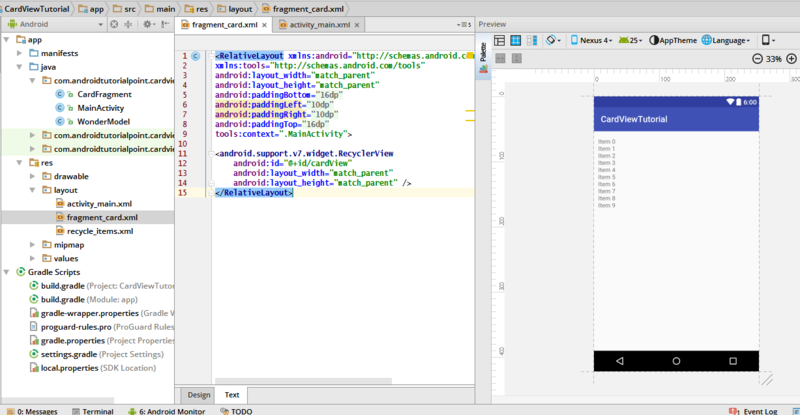 Open Android Studio and create a new project Android CardView Tutorial and company domain application.example.com (We have used our own company domain i.e androidtutorialpoint.com. Similarly you can use yours). Now, Gradle will sync your project and add the dependencies. Create a layout file by Right-clicking on the res/layout directory and selectingNew → Layout resource file. Name the file fragment_card.xml and click OK to create the file.Open the file add the following code. Let’s create a layout file. Create a new Layout resource file name it recycle_items.xml and paste the following code. The layout is pretty much self explanatory, We have used a combination of LinearLayout and FrameLayout‘s to generate a beautiful Android Carview layout. We have an ImageView for the android cardview background and a TextView for the displaying the name of the place. Then we have used another LinearLayout for rendering the Like and Share buttons. Create a new fragment, name it CardFragment.java and add the following code. Let’s use arrays to store the name and ImageId for each 7 wonders. We have already added the photos of the places to the drawable folder. You can download the code by clicking on the Download Now Button provided at the top. In the onCreate() method we use the initializeList() method to initialize the ArrayList in Android Cardview which will be passed to the Adapter later. Following is the implementation of the intializeList() method. Add this method after the onCreate() method in the file. A view Holder is required to hold on to the views, so add the following code. The above code extends the RecyclerView.ViewHolder class and references the ImageView and the TextViews for each view it will be holding. It also has setOnClickListener() attached to the likeImageView and the shareImageView. On clicking the like button the state of the button is toggled and it shows a corresponding message that it has added/removed the item to/from favourites. In the OnClick() for the shareImageView an Intent is fired that shows an option to share the image of the place you have selected. Next, extend the RecyclerView.Adapter class, this adapter is link between the RecyclerView and the data which we want to list. It creates required ViewHolders and also binds the ViewHolder to data from the WonderModel class. onCreateViewHolder() : Inflates the layout and creates a new view Holder. onBindViewHodler() : Binds the data to the view holder. getItemCount() : returns the size of the data to be dispalyed. Use the following code to create a MyAdapter. In the onCreateView() method of the CardFragment.java, we reference the RecyclerView that was added in the layout file. We create a new LinearLayoutManager and later set the RecyclerView to use it. The purpose of the LayoutManager is to handle the positioning of the list items and scrolling behaviour. Here is the completed CardFragment.java file. Next, we will be hosting CardFragment in the MainActivity. Open MainActivity.java and add the following code. The layout file for MainActivity i.e. activity_main.xml consists of a FrameLayout as a fragmentContainer. Run the App and you should see a scrollable List of 7 Wonders of the world. Try scrolling through and clicking Like or Share to share the photo. So our Android Cardview Tutorial is complete. Please comment in case you have any doubts or suggestions. We hope this tutorial will help you getting started with RecyclerView and CardView on Android. You can reuse the cards to create beautiful apps that have a list interface. We will soon be covering more such tutorials. Till then stay tuned and don’t forget to subscribe our blog for latest android tutorials. Also do Like our Facebook Page or Add us on Twitter. Click on the Download Now button to download the full code. Very useful tutorial! Works perfectly fine. Thank you! Pleasure Abdul :). Keep learning. One of the great guide on android card view tutorial. Very interesting and useful guide. Every article published on this blog is awesome. Hye.. I’ve downloaded and running the code in Android Studio but the recyclerview keeps showing me the list of the items and not images that it should be. Please help me to solve this out. Bro, how can I write a listener for the cardview ? I want to lauch another activity when the user clicks on the cardview element. Where can i find a way to do that? I have used the above codes in studio. It is displaying images, favorite button is working when I remove onClick from viewholder. When I add onclick block back again. It says getActivity () cannot resolve in favorite and getResources () , start activity cannot resolve. It is awesome tutorial for recyclerview I found on all. Share option is not working for me. Means its says file format is not supported. And I want to know how to save the image to gallery. It is awesome tutorial I ever found for recyclerview.